We who have a relationship with God probably don’t think too often about Jesus’ choice in our salvation process. Jesus did have a choice, and he chose (and chooses) to open a way for us to the Father. Having a Father in heaving is wonderful amazing blessing for this life and a hope-filled promise for the next life. We have a powerful person (for lack of a better word) on high who is on our side and working for us. He made us (Psalm 139:13), planned our days (Psalm 139:16), he guides our very steps (Isaiah 30:21), and he knows how to give us good things (Matthew 7:11). This is the father we have and can learn to know better and better. But how do we know him? Jesus’ blood that was shed on the cross didn’t just wipe away the sins on our heavenly record. It did do that, but it did so much more. Jesus’ dying on the cross took the separation that was between us and God because of those sins, and he brought us into the presence of the Father. I imagine a scene where there’s a brightly lit courtroom full of happy people, very much like the ballroom scene in the children’s story, Cinderella. Instead of two people meeting and falling in love, there’s me and Jesus and Jesus has loved me for a long time and is so happy that now we finally get to spend some time together. Not only that, but He wants to introduce me to someone: His Father. No one gets to meet His Father unless He decides to introduce them. I image that we’d walk into the ballroom and every eye is trained on us. A path clears between us and the dais of the king, where the King of Glory sits. I walking up to his throne and, full of the freedom that comes from knowing Jesus, I smile and say, “I’m so glad to meet you. If it’s ok with you, I’d like to spend the rest of my days and all my eternity getting to know you better.” And, because He loves me, He laughs and hugs me. Ok, so that’s not probably not very realistic, but I love the imagery anyway. And I love the reminder that Jesus is the reason that I can know God and spend every day with Him. 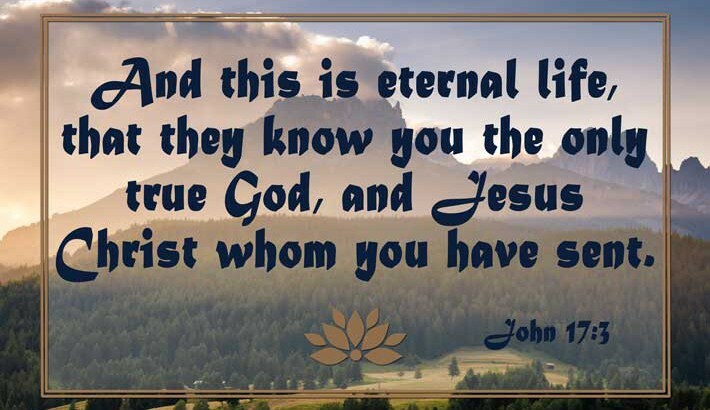 Eternal life, here I come!